Twin Peaks, New York, and Patience: An interview with Peter Hogan, writer of 'Resident Alien: An Alien in New York' – AiPT! AiPT! had to opportunity to speak with Hogan about Harry’s latest adventure, An Alien in New York. The science fiction and mystery genres go together like Hall and Oates. Since 2013, Peter Hogan and Steve Parkhouse have collaborated on Resident Alien, a series about an alien stranded from his home planet who has assumed the identity of small town doctor Harry Vanderspeigle. Harry is fascinated by Earth and solves mysteries that come along. Recently, we had to opportunity to speak with Hogan about Harry’s latest adventure, An Alien in New York. AiPT! : When looking back at reviews of the previous Resident Alien series the small town atmosphere is consistently praised and is also well conveyed. As the title, An Alien in New York suggests, Harry will be in New York — the exact opposite of a small town. Why did you decide to move the setting and what challenges did you face? Peter Hogan: To be honest, I thought of the title first. I saw a documentary about Sting’s song ‘An Englishman In New York’, and how different immigrant groups had adopted it and recorded versions like ‘An Armenian In New York’, ‘An Italian In New York’ and so on. So, I thought it’d be nice to do a version for Harry, because he’s also kind of an immigrant. So I had to come up with a story to fit that, and find a reason for Harry to go there. After that it all just grew organically into a story about immigration, and homesickness, and art, and lots of other things. Of course, I wrote this a couple of years ago, and since then the immigration aspect has become a lot more topical than I ever thought it would be. I’ve also always loved New York, so that’ll show through, though since Harry’s visit is a brief one, what you’ll see of it is basically a series of snapshots. Or postcards. AiPT! : Which famous detectives influenced your writing? Hogan: I don’t know that they’ve influenced my writing, but my favourites are probably Philip Marlowe and Nero Wolfe. AiPT! : Adapting comics into television shows has grown increasingly popular over the years and detective shows have been a staple of television for decades. In the past, there have been talks about making Resident Alien into a television series-and it has the characters and story to make the transition. Is there still a chance we will see Resident Alien on TV? Hogan: Yes, there’s a chance. We’ve been talking to people about it from the very beginning, and we’re still talking to people about it, and … that’s all I can really tell you for now. If it happens, I’d just like to see an adaptation that – at the very least – stayed true to the spirit of what Steve and I have done, because I’d rather there be no adaptation at all than a bad one. AiPT! : What projects are you currently working on or do you have upcoming? Hogan: Various things that I can’t tell you about, but none of them are comics. Not because I don’t want to do more, but currently no one else is asking me to. AiPT! : What were your influences when first coming up with idea for Resident Alien? Hogan: Steve started it all, because I wanted to work with him again and he wanted to do a story about aliens. Neither of us wanted to do yet another thing where the alien was the villain or a monster. We wanted to do something where the alien was just a nice guy who happened to be stuck here and was trying to get along with us. The only role models I could think of that fitted with that were The Man Who Fell To Earth and the old My Favorite Martian TV show, so I guess those were slightly influential in some ways. AiPT! : Resident Alien gives off a very Twin Peaks vibe. Did you see the most recent season and if so what did you think? Hogan: Haven’t had a chance yet. I thought I’d better re-watch the original first, so I started doing that and then I got sidetracked into other things. Must get back to it, but there’s never enough time to watch all the things I’d like to. I used to be a movie critic years ago, and sometimes watched four or five movies a day. I miss it. AiPT! : How would you describe Resident Alien to someone who has never read it? Hogan: It’s a mash-up of sci-fi tropes and murder mystery plots. Hopefully a bit more than that as well. AiPT! : You have said in the past that the best balance for Resident Alien is to do a miniseries each year. Do you ever see it becoming a monthly series? Hogan: Right now, no. I suppose if a TV or movie version got off the ground, Dark Horse might want us to produce more than we’re currently doing, but I can’t see us managing a monthly. Maybe even more mini-series and the occasional one-off graphic novel. AiPT! 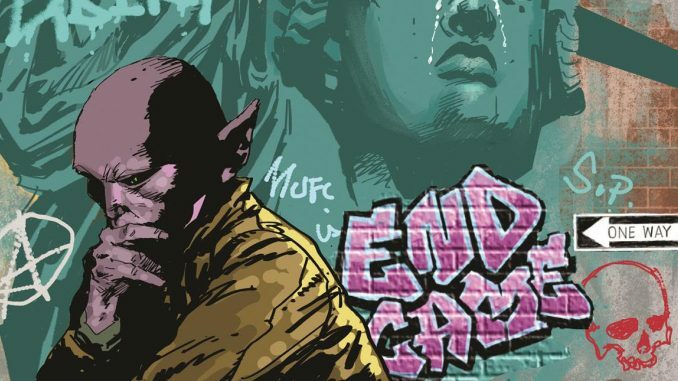 : How long does it take to write one story arc for Resident Alien? Hogan: A lot longer than it should, from a financial point of view. I probably put twice as much work into these series as I have into other things … but I think that definitely shows in the result. AiPT! : The characters in An Alien in New York are well written and come off as very down to earth (no pun intended) and real. When writing a Resident Alien story do you put more premium on the story or on the characters? Hogan: They kind of go hand in hand. I mean, I might have ideas for a story, but it’s the characters who’ll end up telling it. AiPT! : Steve Parkhouse’s art fits perfectly with the story and writing of Resident Alien. How much input does he give to the story? Hogan: We put a lot of work into deciding what Resident Alien was going to be, right at the start. Since then we pretty much trust each other to do our jobs, and we just get on with it. I do try and give Steve a lot of leeway visually, to handle things how he sees best, and I’m always excited to see what he comes up with. This current story includes an artist as one of the characters, and we get to see what his paintings are like. I pretty much left all that to Steve … and I was delighted at some of his choices, like having a painting of Jack Kirby in there. AiPT! : If I am looking for an alien detective should I hire Harry Vanderspeigle or John Jones? Hogan: Harry’s probably more fun, and more relatable. One of the nicest reviews we’ve ever had called Resident Alien ‘J’onn J’onzz done right’. AiPT! : How did you come up with the idea for Resident Alien? Hogan: Years and years ago I was visiting an English friend in New York and saw his resident alien card. I thought at the time that’d make a great story title, and when we were getting this off the ground I remembered that. The whole concept just grew organically from there. AiPT! : How easy will it be for a new reader to get into this series? Hogan: Pretty easy. Obviously, there are four books before this one, but I’d say you can jump on anywhere. All you really need to know upfront is what we tell you on the inside cover : he’s a shipwrecked alien hiding out as a small town doctor, though no one seems to be able to see what he really is. AiPT! : Harry becomes an amateur detective while waiting to be rescued. What do you do in your spare time? Hogan: I don’t think I’ve actually got any spare time ! I look after my kids, I do a lot of walking, a little bit of cooking and not as much reading as I’d like … and a lot of the time I’m also writing in my head as well. It’s kind of a full-time gig.